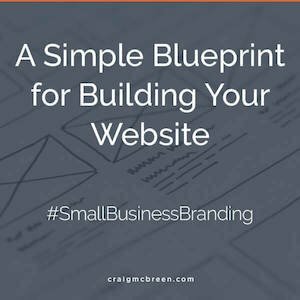 Here’s a question: How do you build the best website for your business? And another I’m asked often: How do you start to design a website? Well, there’s certainly no perfect formula, but I think you need to think about the big three: Branding, SEO, and Content. Because modern SEO, content marketing, and branding have power. And you have to think about the power of each, and how they work together, to design a site that brings the right people to your door. 1. SEO, if done right, will make it easier for people to find you. 2. If you write valuable content they’ll come to know, like, and trust you. 3. Branding language is how you communicate with them. Tell them what you do, how you will help them, and what they should do next. The look and feel of your website, combined with a great user experience are crucial. This stuff is part of what gets people to stay on your website. But here’s the problem. Many business owners shopping for website design are almost always focused on pretty websites. They see slick designs and want them. I work with many small business owners and this mindset is almost always what drives them. Website design should be about creating a robust marketing system for your business with your website as the hub. Not just having a slick site that brings on the green-eyed monster of jealousy from your competitors. As a business owner looking to gain traction online your fighting for eyeballs. You are in a war for attention. Hundreds, thousands of other businesses in the vast online realm are after the same thing you’re after — attracting the right prospects. To attract the right people you absolutely, positively have to have a website with crystal clear, unmistakable brand copy. Messaging crafted to attract the right people and convert them into paying customers. So, where do you start with website design? I love great looking websites. But a design-first mindset creates a good looking site with no substance. And this kind of thinking can absolutely kill your bottom line. What is the primary job of my site? I’m guessing, but I’m thinking the answer might have something to do with generating sales. Design-First thinking will never get you there. Design is very important of course but SEO and lead generation are way more important if you want to generate sales. A fetching site might impress a few people, or maybe even win an award for your designer, but how will your ideal customer ever find you without a modern SEO plan. Modern SEO is basically defined as a happy marriage between SEO and branding. About taking a more complete view of how people see your business. There are so many options, such fierce competition, and the search engines are getting smarter and pickier. This means there is no longer an unbending path to your door. But, if you understand that SEO and Branding are like peanut butter and chocolate (kind of an irresistible combo) you understand the key to creating a website that acts as a hub and marketing magnet. You need to think about creating a comprehensive marketing system that helps show the search engines and potential customers the credibility they want to see. And the comprehensive marketing system begins and ends with your website. Modern SEO is about creating extremely useful content relevant to your brand. 1. Represent the goals and values of your brand. 2. Interest and entice your ideal customers. 3. And provide the search engine gods with the credibility signals they want to see. If you are shopping for a new website you must think of your new website as a long-term investment. An ongoing content hub, not a “let’s get this thing designed and live” deal. No! Think about the expansive online space you’re competing in. If a potential customer is looking for a service like yours the internet is their first and last stop. Their browser is the tool they use to research, compare, and ultimately make a final decision to buy. So your goal should be to create content that appeals to your ideal customer and Google. Your website should be built to attract and convert. It should also be viewed as your most important business investment. Great post! This is worth sharing it with my software development team. Keep up the good work!